Boxwood Tips From The Boxwood Doctor, Dave Bradford! We have a good supply of boxwoods in now if you’re needing some for your landscape. Or, if you’d like us to order some of his boxwood fertilizer for your existing shrubs, let us know and we’ll be sure to get some for you. We also have pinestraw rolls in stock if you need some to mulch your existing or newly planted boxwoods. Planting Boxwoods in the wrong location. Some Boxwood varieties will tolerate a little more sun and heat, but in our area, they all like a little afternoon shade if they can get it. Planting Boxwoods too deep. They should be planted slightly higher than they were grown in the Nursery and it’s critical that the soil is well drained. Overwatering Boxwoods. Maybe the most common mistake. Put your hand down into the soil. If it’s wet, cut back on the irrigation. If it’s dry, adjust the irrigation up. Find the right schedule for your soil. Drip Irrigation is a good way to water them. Applying too much mulch around Boxwoods. They should have about one inch of a good clean mulch. Pine straw is an excellent mulch. Deep mulch causes the Boxwoods to root out into the mulch and that’s not good. Not feeding and liming Boxwoods correctly. The only way to know what they need is to soil test. 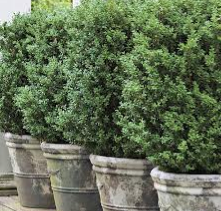 Boxwoods like a soil pH of 7.0, which is higher than what most shrubs like. Boxwoods respond well to good nutrition. We have formulated a fertilizer called Boxwood Special Care (BSC). Boxwoods love this stuff and over time they generally look much darker green and healthier. Poor pruning of Boxwoods. They look more natural when hand pruned. Shearing to prune is best for edging type Boxwoods. Learning to do this is as much an art as it is a science. Failure to provide good pest management on Boxwoods. Some Boxwoods look good with no pest management, but most of them look more healthy and ‘happy’ on a regular maintenance program. Check out the website www.BoxwoodDoctor.com to learn more about our Boxwood Program. This program is not a ‘magic bullet’, but Boxwoods on some type of a pest management program tend to look better than those that are not. Have fun in your garden. This entry was posted in Fertilizer, Tree/Shrubs, Uncategorized and tagged boxwoods on March 11, 2013 by Kris Blevons.